Energy. Ideas. Flexibility. Openness. Learning. Sharing. These are only a few words to capture the International Society for Technology in Education (ISTE) conference experience. It is important to note that the focus of #ISTE2014 was not on technology, digital tools, and gadgets but on the larger picture of relevant education topics – opening opportunities for students to learn without the restrictions of straight rows of desks. This is the second in a series of posts on #ISTE2014 takeaways. For schools to become (or remain) relevant to today’s learning, the use of time (schedules) and space (classrooms, media centers, hallways, lunchrooms, grounds) must be viewed with a different lens, a fresh perspective. And, so it was at #ISTE2014 as reflected in this roundup of sessions provided by Sylvia Martinez of how space is morphing to fit the needs of collaborative pedagogy and student-centered curricula – think Maker Spaces and Learning Commons. For example, take Revere High School in Massachusetts; the 1:1 iPad school adopted flipped learning and revamped library space for a Learning Commons, complete with a Genius Bar, where students earn internship credits for helping others. While an advocate for collaborative learning spaces for some time, I continue to learn how schools are using “space and time” in new ways for interdisciplinary applications. Check out Bob Pearlman’s examples of innovation labs, maker spaces, and learning commons, along with fab labs, weCreate, and other redefining-learning efforts. These examples, including revamped media centers and classrooms, speak to the collapse of the traditional, industrial age use of time and space in providing a more visionary and relevant curriculum supporting student empowerment. Look for further posts on examining the importance of redesigning a school’s use of time and space. Until then, what are you doing in your schools to revamp time and space for learning? Energy. Ideas. Flexibility. Openness. Learning. Sharing. These are only a few words to capture the International Society for Technology in Education (ISTE) conference experience. It is important to note that the focus of #ISTE2014 was not on technology, digital tools, and gadgets but on the larger picture of relevant education topics – opening opportunities for students to learn without the restrictions of straight rows of desks. This is the first in a series of posts on #ISTE2014 takeaways. I’ve been keeping an eye on the Maker Movement over the past few years, and #ISTE2014 had a fair share of sessions on the topic. This roundup, provided by Sylvia Martinez, reflects how the Maker Movement was showcased throughout #ISTE2014, including Gary Stager’s session Invent to Learn: Making, Tinkering, and Engineering in the Classroom. The room was packed, but I made it in to witness Gary’s energetic and passionate session to put kids back into the center of learning by “making.” He made the case of Schooling vs. Making and showcased Sylvia’s Super-Awesome Maker Show. Gary’s notes can be found here. I look forward to reading Gary and Sylvia’s book Invent to Learn, which is on my desk, along with David and Norma Thornburg and Sara Armstrong’s book 3D Printing in the Classroom. Meanwhile, you can find a wonderful book review of Invent to Learn by Kevin Hodgson at Middleweb.com. Are you undertaking a Maker Faire or undertaking the “Maker Movement” in your school or community? Please share! There are those who believe that the list of 21st century skills bubbling up over that last dozen years – critical thinking and problem solving, communication, collaboration, and creativity and innovation – are not new. I would agree with that. However, what has changed is how teachers and students engage in these skills via digital tools. Moreover, I discount that if one uses digital tools in learning that traditional knowledge and skills – deep reading, scientific reasoning, and math – acquisition suffers. Bottomline: It’s not an either/or argument. 21st Century Skills Are Not New – Yet, Some Things Have Changed: While 21st century skills are not new and have been at the core of sound pedagogy, even before industrial-style educational approaches, the use of digital tools has changed the landscape of learning and challenged teachers to be technologically literate. As Clay Shirky said, “When you change the way people communicate, you change culture.” And, that change in culture puts The Teacher in the midst of new learning which they must take on themselves and for students. This new learning does not set aside the necessity of students acquiring basic knowledge and skills but rather builds upon it in a dramatically different fashion than factory-model, Carnegie unit learning. Critical Thinking: Learning while using digital tools does not ignore the importance of critical thinking. With teachers guiding students, which is not a new pedagogy, students can gain knowledge and learn to think critically by conducting effective Internet searches, ferreting out incorrect information, and verifying information before putting it to use in their own computer, the brain. True, good researching skills are needed with printed materials as well. However, learning to use selective keyword searches, Boolean searches, databases, and authoritative online texts is a relatively new skill. To think critically includes interpreting blog posts and comments, tagging, subscribing and annotating, within our personal space as well as our shared learning networks. In order to think critically, a great deal of knowledge is necessary. However, how we gain the knowledge is what has shifted – titled the earth on its edge. What was once locked away in a library is now accessible in the palm of our hands and that fundamentally changes how and what enters our world – what gets our attention – as well as how we interpret and synthesize it, making thinking critically ever more important. Moreover, students who do not have the skills to navigate a digital world are at a disadvantage and may well become the next underclass. Information via digital tools can be used to deepen our capacity to make observations and reach beyond our closed envelope by connecting and communicating with others beyond our immediate, face-to-face environment. To explore history from a different vantage point via gaming and sensory interaction. To see and manipulate the elegance and logic of science and math through interactive online activities. To understand the philosophical debates by not only studying them but engaging with others though digital learning networks. To mash-up ideas and create new ones. : Yes, in the past (and today), we participated and collaborated in classrooms and neighborhoods – learning and playing. We’ll probably continue to do so to some degree. What has recently evolved is what Henry Jenkins coined the Participatory Culture, which calls for new media literacies – an outgrowth of a media-rich society. In his white paper, Confronting the Challenges of Participatory Culture: Media Education for the 21st Century, he calls for the needed skills in the new media culture which build upon the traditional skills taught in the classroom. Hence, new and emerging skills have been identified that are necessary for students to learn today for them to fully create and participate in their future. Digital Citizenship: Yes, in the past (and today), we offered lessons in safety (don’t get in a car – or a buggy- with a stranger), public speaking, and civics. We’ll probably continue to do so to some degree. However, a new consideration has come about – digital citizenship, which includes new skills and considerations in preparing students for today and their future. We must share lessons with students that online communications are, as Shirky observed, “instant, global, and nearly permanent” and that one must cultivate digital footprints so he or she can be Googled well. Collective Action: Yes, in the past, we have undertaken collective action in classrooms and neighborhoods – mock elections, food drives. We’ll probably continue to do so to some degree. Yet, something has changed. In Here Comes Everybody, Clay Shirky observed, “Gathering a group of people and getting them to act used to require significant resources, giving the world’s institutions a kind of monopoly on group effort. Now, though, the tools for sharing and co-operating on a global scale have been placed in the hands of individual citizens.” Today, we, teachers, must share lessons with students that they have the power to topple corporations and governments sitting in the palm of their hand. We must share lessons with students that they are in the midst of an upheaval of “how things have always been done.” And, we must share these lessons with students as we are learning them ourselves. As part of learning new lessons, teachers must continue to be critical thinkers, become scholars, ask the right questions, listen for what is not said, seek out connections, and retool and remix their skills. 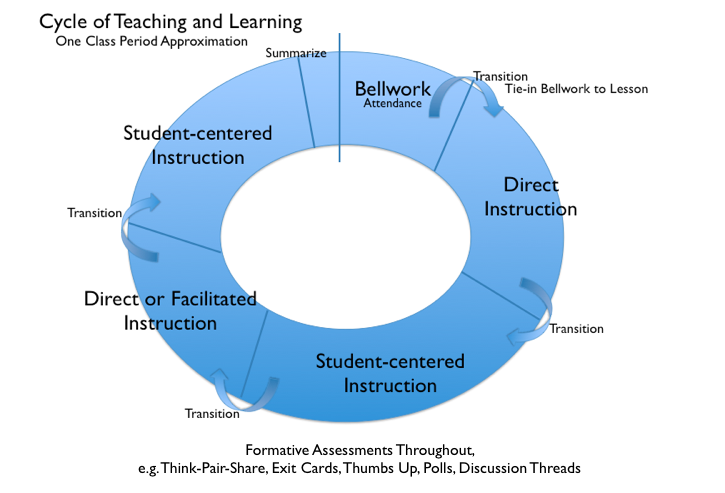 The cycle of teaching within a traditional classroom; the design can also be applied to blended or online environments.